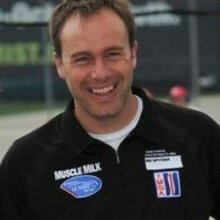 Due to the tremendous response for Online Engineering Instructor Brandon Fry, Chief Race Engineer and Team Manager for Muscle Milk Pickett Racing, we are pleased to announce that he will extend his tenure an additional week! His answers to your questions will be posted daily through October 19, and you can still submit questions via feedback@safeisfast.com. 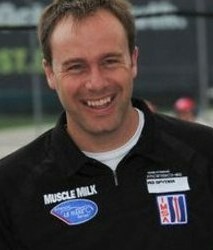 Muscle Milk Pickett Racing Team Manager and Chief Race Engineer Brandon Fry has worked his way up through the ranks in a variety of racing series, including Grand-Am, Champ Car, INDYCAR and the ALMS. He started out as a mechanic in the mid ’90s, acquiring hands-on mechanical skills while attending university, before quickly moving up to positions of assistant engineer, race engineer and chief race engineer with top teams such as Herdez Competition, RuSport, Walker Racing and Forsythe Championship Racing. He joined the Muscle Milk team in 2010 and now oversees daily engineering operations, on-track vehicle configuration, simulation programs as well as communication with the team’s partners in regards to car development and parts. Additionally, this season Fry has taken on the role of Team Manager. Brandon Fry answers your questions! I hear a lot of drivers talk about a car pushing entering a turn and then becoming loose on exit. Isn’t the loose condition on exit the result of the amount of steering input at entry to correct for the initial understeer? Often this is the case for a car that is understeering significantly at the apex of the corner and then, due to the level of steering input used at some point, the front gains grip and the rear is overpowered, leading to an oversteer condition. As I mentioned in a previous question, often what happens at the start of the corner has an effect on the later parts of the corner, of which this is a good example of. As such, when the driver discusses the issues that he is encountering in a corner, it is important to think about how much of the later comments are a result of previously encountered issues as well as what changes can help multiple issues in the corner. Often a change can be made to help the entry of the corner, which will also have an effect on the exit of the turn. This is not a setup question, but I’m just curious on your thoughts on the Radical DeltaWing that will race at Petit Le Mans? I hope that nobody crashes it out so that we can see its true potential. The diversification of the ALMS is part of what makes it so special! Let’s pray that the unification of sports car racing will still embrace the great racing formula and vision that Don Panoz created. The Delta Wing is certainly a very interesting car and a neat concept. It is likely that it is an indicator of direction for future motorsport. The diversity in the ALMS is certainly part of what makes the series a fan favorite and very special. Part of what makes the Delta Wing so special is the out-of-the-box thinking for the car, which does not fit in current guidelines. As such, the performance target for the car is similar to that of a LMP2 car, which is close to the lap times that it ran in the Monday test session at Road Atlanta. How do you find the proper shock settings (rebound and compression) on a 950 lb vintage Formula 2 car (equipped with Koni 8212 shocks) without a shock dyno or prior knowledge of the settings? What does too much rebound feel like and what does too much compression feel like? What are the symptoms of that? Thanks in advance for sharing your knowledge! To start with, I would say that if you have no prior knowledge of the damper settings I would suggest getting the dampers sent off to someone with a dyno for testing to ensure that they are built correctly (do you know for sure that they are valved the same side to side and that all four are in proper working order?) as a good starting point. It doesn’t matter how much you know about vehicle dynamics; if you are not sure that the dampers are working as expected, you are likely to be left scratching your head. Your task is likely further increased in difficulty level as you mention that it is vintage, so I would guess that data acquisition is either extremely limited or unavailable. Without the ability to view data, your diagnostic tools are further limited. Too much compression damping will make the suspension feel stiff as it hits a bump. Too much rebound damping will not allow the suspension to return after a bump. This can give the impression of having to wait on a wheel to regain grip as well as being stiff, particularly cars with bump rubbers or rising rate suspension as the suspension does not return to the static ride position quickly enough between bumps and therefore ‘jacks’ itself down. Too little damping and the suspension will feel uncontrolled and move excessively. As you are a bit in the blind, I would suggest starting on the lighter side of damping as too little damping is likely safer than too much. Mr. Fry, Thanks for the opportunity to make this inquiry. I’m an F1 fan. Is there a way to suggest to a team several engineering innovations where the ideas are protected and, hopefully, compensated? My initial impression would be that this would be a VERY difficult process for you to achieve any sort of satisfactory result. Keep in mind that these teams constantly “spy” on the opposition in an effort to steal any ideas or tricks that another team has come up with. Along these lines a constant new “trick” component comes to light nearly every year and spreads through the paddock. Think mass dampers, inerters, blown diffusers, blown rear wings, etc. Having said this, I do recall that the inerter technology that was used by McLaren Racing was designed by a professor at the University of Cambridge and subsequently licensed to Penske Racing. The mention of this concept suggests that the designs have been patented via the university or professor and naturally some compensation agreement would have been worked out. I have to imagine this is an incredibly difficult task. Good luck! I just acquired a 2004 GT3 modified with JRZ hydraulic suspension. Where is the best resource to learn about how to fine tune my new suspension on the track? I would like to learn how to do this on my own trackside if possible. Thanks! Unfortunately most damper books are very technical or dated. Jan Zuijdijk of JRZ recently wrote a book (Vehicle Dynamics and Damping) which might be a good place to start but certainly Carroll Smith’s Tune to Win or Competition Car Suspension by Allan Staniforth might be helpful as well. Additionally, as you mention doing track days, I would suggest making a small change on say the front compression adjuster (I believe these dampers only have a single compression and rebound adjustment – “two way”) to get a sensitivity of the adjustment and then try a rear adjustment and go from there as you get a feel for the sensitivity of each adjustment. A Formula 1 question: During practice and qualifying, cars are allowed to use DRS all over the track as opposed to a single DRS zone during the race. My question is, if the rear wing DRS opening was mistakenly left open at the end of a straight and into a corner, would the car have enough grip to make it through the corner? A faster corner (or bend) whereby the downforce level with DRS active is more than what is required to make the corner will likely not pose too much of a problem should the driver be able to cope with the (significantly) different aero balance. Conversely, on a slower corner, the driver is unlikely to brake sufficiently for the corner in the first place as downforce improves braking significantly. As an engineer and having worked with both male and female drivers, why do you think that there are not more professional female drivers? How has your experience been with engineering female drivers? Good question! Engineering a female driver is no different than engineering a male driver. Once the helmet goes on, a driver is a driver; it does not matter if they are male, female or whatever! I am not sure why female drivers are not more common but I do think that they are certainly more common now than they were a decade ago or two ago. As more female drivers make it to the upper echelons of the sport it will likely become even more interesting for young girls to compete in. What is the actual sequence of a race car set-up for a road race (for example, what happens first, second, and so on to include… tire pressure, camber, toe, caster, shocks, springs, aero and etc.)? Good question! We will start by thinking about the track that we are preparing for. What characteristics define this track. Is it bumpy or smooth, fast or slow, flat or undulating, etc.? We will also run loads of simulations to get a feel for the sensitivity of the track to aero levels, braking, gearing, grip level, etc. Based on our simulation results and often historic data, we can start to think about what sort of aero configuration we are likely to run. The aero level will have a direct impact on the gearing (less drag, more speed, longer gear ratios, etc.). In a similar fashion the simulation will provide an idea of what ride height range produces the best performance, which provides direction for springs, ride control devices, etc. The simulation and historic data can also provide an idea of mechanical balance targets. With an idea of suspension travel, cambers and toes can be checked for expected movement during travel. Track knowledge, historic data and simulation or rig testing are often used for damper setup. As you can see the simulation really starts to define some of the ranges for many of the setup items. If you could choose only three tuning setups that had to be right on your car, what would you say are the most important (tire pressure, toe-in, camber, aerodynamics, etc.)? This will depend on the type of car that you are running and the series’ rules. For example, if the car does not have much downforce or scope for that adjustment (think Spec Miata), aerodynamics is not a priority. If the regulations require a specific spring rate, as some series do, this item will not be the difference maker in the race result. Other quick examples might include Formula One where the regulations require a large tire sidewall and the circuits are very smooth, therefore damper adjustment is less critical than say INDYCAR racing on a bumpy Detroit street circuit. As a Team Manager, what sort of responsibilities do you shoulder? How difficult or easy is it to work with drivers? As an engineer, what sort of day-to-day responsibilities do you have? The team manager role means that I oversee the day to day operations of the race team. I try to ensure that each team member has the “tools” that they need to complete their job while respecting the team’s budget. Additionally, I work to hire the right people to fill specific race team positions but who also fit into the team’s culture. As I also engineer the car, I have wonderful support from the team members to accomplish this task! The drivers at Muscle Milk Pickett Racing are incredibly easy to work with. Certainly this is not the case with all drivers in the sport and is an attribute that the team seeks when selecting a driver. At Muscle Milk Pickett Racing we have a couple engineers on full-time staff and a few more that join us at the race track. Engineering will work with the crew after each race event to track part use and mileage, organize event issues and failures (what happened that we need to keep from happening again), investigate and report on our car performance and that of our competitors (lap time during the event, track segment performance, race strategy, fuel strategy, etc.). Prior to the next race, simulations will be completed for many various car setup options and parameters. Based on this simulation data and reports and track data from previous years, the car setup will be determined. Often compromises that are made in the determination of the setup or historic trends for the track or car will help to determine a plan for test items. Additionally, the engineering staff will investigate ideas for improving the performance of the race car as well as design components which can be performance based or improve the running of the car. Would you please describe “roll axis” and how changes to it can affect handling and how to set it in a baseline setup? The roll axis is a line that connects the rear roll center height to the front roll center height. Roll centers are a function of the suspension geometry setup and, like spring and anti-roll bars, contribute in determining the distribution of load transfer in the race car. Much like softening the anti-roll bar, lowering the roll center height evens the load distribution on a wheel pair (which will increase tire grip) and reduces roll resistance. Each car will have different criteria for suspension design and options for adjustment. I have engineered cars without any options for roll center height adjustment. Other cars have considerable adjustment options and are very sensitive to suspension geometry adjustment of which the roll center height is a function. The roll center height, like corner springs and anti-roll bars, contribute to the mechanical balance of the race car and therefore are part of the consideration for developing the setup. From your perspective as a race engineer, what would you describe as the most important qualities that an endurance racing driver should have or work to develop? Thanks for your time! As you have suggested, endurance racing is a bit different from other forms of racing and therefore requires some different skill sets. Traffic management is critical. Multiple classes of which you are routinely passing or being passed certainly presents a big challenge. Increase this difficulty level by adding wildly varying experience level and abilities and changing track conditions (night, marbles, rain, etc.)! Some drivers develop this ability well and others constantly struggle, losing pace or, worse, damaging equipment with poor judgment. Another skill set that is certainly unique to endurance racing is the idea of jumping in a car and immediately getting on pace to join a race in progress. This could occur in the middle of the night or in the wet or after a sleep period (think 24-hour races) or as a battle for the lead with another car immediately after you exit the pits or some other random condition that is potentially considerably different from the last time that you were in the car. As technology has improved, so has reliability, which means that even 24-hour races have turned into all-out sprint races. However, while drivers will run at maximum pace all race long they still need to make sure that they do not abuse, damage or otherwise use up the equipment. End with a long pedal after a two-hour INDYCAR race, no problem. End with a long pedal after a double stint to start a 12- or 24-hour race and the team is going to be playing catch up. Which quality is the most important? Poor execution of each of these mentioned skills could end a race prematurely, however, I would suggest traffic management is the most important as it is a constant. All race long, depending on your class, faster cars will be passing you or you will be passing slower cars. Lose too much time in this process or make a mistake and it can impact your result. As a Mechanical Engineer who is currently working in aerodynamics, how do you suggest I might be able to break into racing as an engineer? Like many professions, it is difficult to find a job in racing without motorsports specific experience. Depending on your current work – you mention that you are an engineer currently working in aerodynamics – you might find that your experience helps your transition depending on its specific relevance to motorsports. Depending on your goals and interests, I would start by sending a resume to NASCAR and INDYCAR teams – in the U.S. those series are most likely to have a position for someone with an aero background – as well as race car manufacturers – Riley Technologies, Multimatic, Swift, Dallara come to mind. Beyond this, volunteering or finding an entry-level position, much like a student graduating school, would apply and might be your best option. As someone who has no prior experience in racing but is intent on getting started, I’m curious what vehicle you would suggest to purchase? My budget is in the range of 60-80K, and I’m just wondering what would be a good “starter” car to begin learning the basics of racing? Interesting question! Without knowing a bit more about you it is hard to give you a very specific answer. For example, since you mention having no prior motorsports experience and have a reasonable budget, my guess is that you are not a teenager looking to make this into a career. The next piece of information that would be helpful would be to know what type of racing most interests you. Are you interested in circle track racing, road courses, dirt, pavement, rally, endurance, open wheel, sports cars? So for some general thoughts… With your lack of prior experience, I would look into attending a racing school. This will improve your general motorsports experience, give you a bit of insight into racecar driving and an idea about a specific type of racecar. You can find driver schools for almost any form of motorsports from NASCAR and formula cars to rally and sprint cars. As you learn about a specific car and form of racing you might find that it is not exactly what you expected or is wilder than you anticipated, however the environment at a racing school is controlled and the cost outlay is (relatively) small. Additionally, with your lack of experience, I would suggest a “used’ “first racecar. The budget that you mentioned is sufficient for many classes of short track or SCCA racing but as you learn, the chances of a mistake and damage to the car is high so it makes sense to take it a bit slow to start. The specific car will likely depend on what class you decide to start racing and what people are racing locally/regionally. I would suggest getting something as close to what the front-runners are using in whatever series you end up racing. If you run something out of the norm or different it might be difficult to determine how your driving compares to the drivers you are racing. Along those lines if you can purchase the championship or front-running car from the previous race season it might provide a well sorted reasonable reference to start with. Whatever you decide on, good luck, enjoy this new challenge and have fun! What is DRS? What is double DRS? DRS stands for Drag Reduction System. It is a system currently used in Formula One whereby the rear wing flap is able to be opened on the straights to reduce both downforce and drag. As it is used on the straights, the downforce is not required and the drag reduction improves acceleration (and therefore, end of straight speed). The regulations allow unlimited use of this device in sessions leading up to the race. In the race only one straight (zone) is designated for use (at times a second zone has been added) and is available to a car trailing another car by one second or less, only two laps after the start or a restart of the race. As mentioned, DRS reduces both downforce and drag – however the downforce removed is provided by the rear wing. As such, DRS use creates a forward shift in aero balance. This is not a significant problem on the straights, however as DRS use is unrestricted prior to the race, for qualifying an advantage could be gained in corners whereby the downforce level is excessive for the speed of the corner (think high speed kinks, etc.). This is the concept behind double DRS – when the rear wing flap is opened, an opening is created whereby air is channeled back to the front of the car to reduce the effectiveness of the front wing, similar to the “blown rear wing” concepts of the past few years. Ideally, this creates a better balance whereby DRS can further be exploited for its drag-reduction benefits. How much drag is created to produce so much downforce in a F1 car and/or Indy car? How much horsepower is used just to overcome the drag? Aero numbers are difficult to obtain in the best of circumstances, let alone a fiercely secretive F1 team. We could speculate a bit and probably be somewhere in the ballpark… The previous generation Indy car on a superspeedway would likely have just under 1000 lb of drag at 200 mph and have a lift-over-drag ratio (L/D) of roughly 1.7 (therefore ~1700 lb of downforce @ 200). It takes 533 hp to do 200 mph. The Panoz Champ Car in high downforce trim would have roughly 1730 lb of drag at 200 mph and have a L/D of 3.3 (therefore ~5700 lb of downforce at 200). It would take 923 hp for them to do 200 mph. LMP sports cars have a L/D – depending on downforce configuration (low or high) – of somewhere between 3.5 to 4.1. As such, I would expect an F1 car to be 3.2 to 3.8 depending on configuration and have more than 5000 lb downforce at 200 mph. It is important to note that drag increases with the square of speed. As such, these numbers are quoted as a reference speed of 200 but the drag at 100 mph is considerably less. How long does it take to build a car, or rebuild one after an accident? Our 2012 HPD ARX-03a was delivered to our shop in several boxes in January. We tested 22 days after the tub was delivered. It took one of the other HPD runners eight weeks to build their car. So, it really depends on the team. An Indy car with all of the detailed prep work for a high-speed oval like Indianapolis can take months to build. Repair depends on the severity of the damage. After we crashed at Baltimore it took a solid week to repair the car and it did not look like much damage was done when viewed with the bodywork on. Certainly this rebuild at the shop took longer than it might have at the track as every component was inspected and many parts were crack-checked. This repair would have probably happened in several hours if the crash had occurred prior to the race and the repair was required to complete the weekend. It is increasingly clear that fossil fuels have a limited future, so hybrid systems are likely to be the near future focus. KERS are an option for this and, as such, involving this technology in motorsports is likely a benefit to society. Is it potentially dangerous? Certainly, just like any new technology that is in the infancy of development. KERS systems already allow cars to produce increased straight line speed. In a racing sports car with nearly 50/50 front to rear balance, is it reasonable to place the same size calipers and rotors at the front and rear or is it overkill on the rear? Thanks! This situation will likely be too powerful for the rear tires. Keep in mind that the act of braking will transfer increased weight on the front tires, which will increase the grip potential of the front tires, while at the same time the rear tire load will reduce. Having said this, I have seen race cars with similar size calipers and rotors on both ends of the car. One car which comes to mind had several ‘Band-Aids’ on the rear brake system to reduce performance. I have to say I am not a fan of this approach as it only increases the complication of the system, if nothing else. Hi Mr. Fry, From an engineering standpoint at long tracks like Road America, how do you initially set up the car aerodynamically? It seems quite difficult to find the balance between getting maximum straight-line speed while still having enough downforce to keep the car planted in the corners. Thanks. Our aerodynamic configuration is determined by a series of simulations of various downforce levels. After sweeping the range of downforce levels that we have available, we can often rule out a large number of configurations that will not be suitable for a given circuit. In many cases, the results are peak around an ideal configuration with lap time increasing with either an increase or a decrease in downforce level. At the beginning of the weekend when the track has the least amount of grip, we will likely start with the downforce level on the higher side and will lower the downforce as the track grip level increases and the drivers become more comfortable. Certainly it is important to consider competitors, weather conditions and peculiarities of a circuit for the aero configuration. For example, at a recent race, coincidentally at Road America, we ran a downforce configuration that we felt provided the lowest lap time. The Dyson car was a bit slower in overall lap time but quicker on the straights. At the beginning of the race, we were able to build a gap but had an issue. Late in the race we caught the Dyson car but were not able to pass as the Dyson car’s straightline speed advantage was enough to overcome our outright pace advantage. Interestingly, our lap times slowed by a couple of seconds per lap once we caught the Dyson car, which proves that despite the speed potential of the car our advantage was not realized due to the speed advantage of our competitor. Many teams do not have access to sim programs. In this case I would suggest grouping tracks passed on previous experience. Look at average corner speeds, top speeds, number of brake zones, etc. and group tracks together based on similar criteria. Watch competitors to see what downforce level they are running. If you have a situation where it is possible to achieve a similar lap time with two drastically different aero configurations, try to envision how the race is likely to be won or lost. Is it likely to be a pack race where the guy with the least drag can squirt past to the line or if too little downforce is run will the tires go off more leaving guys squirming around in the last few laps. I know most DAGs are mechanical engineers, but as a DAG they obviously work with a lot of electronics. Any advice on subjects to study up on for a mechanical engineer looking to work as a DAG in an open-wheel series? Also, what software is commonly used for running race set up simulations? Is there a Pi program that is often used or is there another software that’s used more? Thanks! As I mentioned in response to another question, a lot of aspiring race engineers spend time as a DAG, which requires knowledge of electronics, wiring and sensors, which is not necessarily something that a mechanical or aerospace engineer has a strong background in. Books on instrumentation and control systems might be a good start. A few books that have been written specifically for motorsports but might be a bit dated include Competition Car Data Logging by Simon McBeath, Data Power by Buddy Fey and the Hands On Race Car Engineer by John Glimmerveen. Additionally, many motorsports data acquisition companies will do training. Beyond the nuts and bolts of DAG work, several good books exist for data analysis. Check out Analysis Techniques for Racecar Data Acquisition by Jorge Segers and A Practical Guide to Race Car Data Analysis by Bob Knox. Many options exist for track simulation software. Pi (now Cosworth) used to be the standard and still have a sim program which can be purchased. Other options include Chassis Sim (http://www.chassissim.com), DATAS Race Sim (http://www.datas-ltd.com), Ansible Aero Lap (http://www.ansibledesign.com/aerolap.htm), ADAMS (http://www.mscsoftware.com/Products/CAE-Tools/Adams.aspx) and AVL (https://www.avl.com/ast). Each of these packages varies in scope, complexity and cost. As a racing engineer, do you ever get behind the wheel of your car and drive it? Never… I should probably work on that, huh? I do race karts, road race karts where you lay down similar to a luge and run on sports car tracks like Mid-Ohio, Virginia International Raceway, Daytona International Speedway, Barber Motorsports Park, etc. The top speeds are over 120 mph and often are quicker than many of the slower classes of motorsports for significantly less cost. Karting, whether it be road racing as I mentioned or the more common sprint karting on a smaller purpose-built kart track, is an excellent way to learn about driving and a good experience for anyone involved in motorsports. How do you decide how big to make the vents over the wheels in the fenders to reduce pressure in the wheel well, and does it matter with average speed of the vehicle or tire size? The vents above the wheels – or louvers as they are called – are designed into the fenders and are not adjustable from the car manufacturer (HPD). I am sure that Wirth Research has done considerable CFD studies and analysis to optimize the shape and size of the louvers. Recently, holes have been mandated over the front and rear tires in an effort to reduce the tendency for the car to leave the ground while in yaw (sideways). The rule requires a hole opening of a minimum size. As you may have noticed, the sports car manufacturers have come up with several solutions for minimizing the increased drag by this rule. Over time, as the manufacturers study each other’s solutions the wheel arch variations will likely reduce between the cars. What is the most valuable tip you would have for young drivers when trying to maximize the value in each session on track whether it be testing, practice, qualifying or races? Also, for you to do your job properly, what are you looking for in an “ideal”, but realistic, driver? (For example, technical skills, feedback, desire/motivation to learn, etc.) Maybe this could help shed some light on things young drivers could start working on earlier in their careers. I would suggest that it is important for young drivers to have a goal for each session that they are on track and to continue to keep that goal in mind. This goal might be something that the driver himself wants to achieve or something that the team wants to achieve. We do an engineering meeting prior to running which details goals and plans for the session. Making the plan forces you to think about what things need to be accomplished in the session. For example, in practice, the goal might be to see what kind of downforce level would be best for the race. In this case, it would be beneficial to run in a bit of traffic, whereas if the goal is to run a qualifying sim, running on an open track is probably preferable. In sedan racing one of the goals for a practice session might be to keep from having contact with another car as time does not exist between the session to repair the car for qualifying. The traits for an ideal driver… Good question! A lot of drivers are fast and as you climb the ladder you will find that speed is not the only thing that separates drivers. Looking down the qualifying order of many of the top professional racing series where the field is covered by a second or less is proof of this. The mental focus and physical stamina to lap at the limit for the entire race are certainly ideal traits. As drivers progress up the ladder from shorter sprint races to longer races where pit stops are completed, it is common for drivers to make mistakes as they are unused to longer distance races. Part of this is the ability to make smart decisions and remain calm under pressure. The ability to adapt to a car but also know when it is important to make the setup change to suit your driving style is a helpful trait. I have seen many drivers that can go fast when the car suits their style however are hopeless when the car is not perfect, while other drivers have the ability to drive around the problem completely. This said, testing can be difficult with a driver that is always adapting to the car when consistency is key. Similarly a driver that is constantly adapting might struggle to identify which setup path holds the better likelihood for performance. Another trait that I have seen very good drivers have is the ability to look at a teammate’s data, see where they could use improvement and then go out the following session and make that improvement. Certainly the ability to analyze the car in real time is important and to make changes to the car or driving style to improve performance. Possibly the car is understeering and the driver can use tools to adjust for this (brake bias, anti-roll bar adjustment, weight-jacker, traction control, etc., are all potentially available tools depending on the series) to reduce the tendency for understeer or the driver can alter his driving style to be easier on the tires without losing too much pace. In addition to identifying this tendency while driving, it is important to communicate this info precisely to the engineer. I spoke a bit about gaining experience in a previous question, but would also add this based on your question. My first job for a race team was essentially to sweep the floors. I helped out wherever an extra person was needed, sometimes it was in the bodyshop, other times putting together suspension, etc. Over time, the jobs I helped on got more sophisticated and at some point I started going to tests and races. 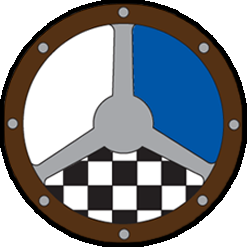 The team was Downing Racing, which designed, built and developed its own (Kudzu) sports car chassis running Mazda rotary engines. As such, in some ways, it was a young engineer’s dream as the team was always designing and developing but that was not part of my job with the team. As much as I wanted to poke my nose around the engineering office, my job was to mechanic/fabricate/general lackey on the car. So I did the best I could at those jobs. It was a great experience and likely too many engineers do not have enough experience getting their hands dirty working on race cars. Similarly, when I got a job as a DAG with a Champ Car team, my personal interest did not lie in wiring looms, Lemo (now Autosport) connectors, electronics or networks, however that was the job I accepted and I did the best I could in that position in hopes that I would move to a position eventually that would better suit my engineering interests. Essentially if I did a poor job at my current position, what confidence would I give to the team I was working for to move me into any other position? Having said this, after hours once my work was completed, did I catch up on the engineering reports from the previous event or discuss topics that I wanted to learn more about with the more senior colleagues on the team? Absolutely, but I made sure that I completed the task that was my primary responsibility on the team. As far as what series would be best for training a young engineer, I would say that they all have benefits and drawbacks, as will the teams in the series, and it will depend on your goals. To start with, does your interest lie in formula cars, sports cars, circle track or production cars? If your heart lies in NASCAR, working in a small formula car series is not likely the most efficient route. After this is determined, have a look at the series that are likely to be able to support a full-time position. Most regional racing series do not have the budget for full-time people let alone someone in an engineering capacity. Certainly if you cannot find a job otherwise, starting out volunteering for one of these teams might be a good option. Generally the bigger the team/engineering group, the more specific the position. So you are likely to learn a lot about whatever specific role you fill for the team. On smaller teams with less engineers, generally the role is more diverse so you will be exposed to a wider range of motorsports engineering topics. For example, a larger team might have a technical director or chief engineer, race engineer, design engineer, assistant or performance engineer, simulation engineer, DAG, development engineer (who might handle wind tunnel testing, rig testing, special projects, etc.) or some combination of this, whereas a smaller team might only have a race engineer and a DAG. While the smaller team will have to manage the workload among less people it will also likely do less testing (track, wind tunnel, rig or otherwise) as the budget is not available to support such programs. I drive a Dodge Viper, stock set up, 3300 lbs, Penske triple-adjustable shocks. In a left-hand turn, with lateral G’s 1.4 as I track out, as I straighten the wheel the weight shift goes to the right side then it rocks or bounces back to left then rocks or bounces back to right, then the car settles in. It only happens on high-speed left-handers. The car feels stable and fast at track-out but I cannot figure out if it is a front to back thing or a side to side thing? Can you give me some ideas about what to troubleshoot? Thanks for your time. As you mention left handers plural, it sounds like this is not a specific corner but multiple corners, which would rule out some sort of undulation or specific feature of the road that was causing this issue. If it is not happening in right-hand turns – thus asymmetric – it sounds like it is likely an issue with something on the car as opposed to a setup issue or (unfortunate) characteristic of the car. I would probably start with checking that the damper settings are the same left to right on all three adjusters. If everything is correct, I would probably send off the left-side dampers to make sure that everything is working properly. As you mention, it is on corner exit so I would be more suspect of the RR than the RF, but it would be worth investigating both. Alternately, it could be a failed spring, bushing or some other suspension component on the right side of the car. Hi Mr. Fry! I am a senior in high school and am considering pursuing a career in automotive engineering. I was wondering what you like best about your job, what you find challenging – either in the long term or in day-to-day tasks – and what you find rewarding about being in the field you’re in. Also, when you’re looking for someone to fill a spot on your team, what do you look for? Besides a mechanical/automotive engineering degree, what aspects of a personality/work ethic/zeal for the sport do you find most attractive in young engineers and what can convince you to give someone the job? Thanks so much. Good questions! Most enjoyable for me is winning. I am a very competitive person and so being a part of a group that rises to the challenge and wins brings huge satisfaction. Having said this, the job has a lot of enjoyable components. I find myself thinking often as I walk out to the timing stand prior to a session on a Friday, on a beautiful morning and the sound of race car engines warming up, this sure beats working a desk job in a cubicle! Coming up with a clever engineering solution for the race car or race strategy that beats the competition is certainly very enjoyable. Competing on great circuits all around the world and big events such as the Indy 500, 24 Hours of Le Mans and 12 Hours of Sebring has also been great. For me, the most challenging aspect would probably be the never-ending push for improvement. On a race weekend teams are constantly improving. From session to session you have a fixed amount of time to digest a vast sum of data, including driver feedback, make the correct changes for increased performance and continue to make improvements during the following session. Even between events your competitors are analyzing the past race and making a plan to do a better job at the next race, so you best plan to do an even better job. Couple this with new components from our partners like HPD on the engines, Wirth Research on the chassis and Michelin with the tires which might also require adjustment to the team’s specific development plans and it becomes hard to find time to catch your breath. In looking for people to fill positions on the team you want to find people with the same drive and commitment. While we do this job because we love it, it is a difficult job that requires long hours, a lot of time on the road and away from families, which can cause issues with people’s personal lives and attitudes. I remember doing a driver evaluation test with two drivers for a drive the following season. Both drivers were extremely fast, gave good feedback, and had potential to (and since have) win races. As the discussion occurred regarding which driver should get the drive, the comment was made that it was perceived that one driver wanted to win, while the other driver HAD to win. This same commitment is what teams look for in employees. I have seen several resumes of very talented potential team members who have said to me that this is all I want to do with my life but then find that they are doing something else for a job six months later and are never heard from again. Obviously it is important to put food on the table but if these people REALLY wanted to work in racing more effort might have been expected. With the high power and dated chassis technology of your ’67 Can-Am car I am not sure that much is going to help the rear of your car! Can-Am cars were insane and impressive beasts!! One-eighth inch of toe certainly does not seem excessive and you could try to increase it to 0.200” – however, I seriously doubt that you are going to do anything significant beyond judicious use of your right foot. Hi, I am a senior in high school taking calculus and physics. What educational and experience pathway would you recommend with the ultimate goal of one day becoming an INDYCAR/ALMS chief engineer? What particular branch of engineering do you recommend to take, and do you know of any colleges that have a particular motorsport slant? Also, should one get a masters in engineering to become an chief engineer, or is a bachelor’s degree enough? Your question is similar to one that I answered previously, but allows a bit more elaboration. As I mentioned previously, most well ranked engineering universities will provide a suitable education. Most race/chief engineers would have an aerospace or mechanical engineering degree. Some schools provide specialist motorsports engineering degrees, which can be helpful and might have connections within the industry that can help get a foot in the door. A masters degree is certainly not essential, however this is a competitive industry and more education is certainly a plus. Additionally, while in school it is important to get as much motorsports experience as possible. I have seen many very bright engineers come out of school wanting to work in motorsports that have no idea what a brake caliper looks like. Most professional race teams do not have the time or desire for this level of training. As with many industries in life, the concept of “must have experience but how do you ever get experience in the first place” applies. For this reason the SAE programs are perfect. Alternately, volunteering is a good way to get your foot in the door. I was happy to be paid minimum wage at my first motorsports job in university – essentially sweeping the shop floor. Go to the races? Not until I proved my worth at the shop. Read Race Car Engineering and Race Tech magazines. I probably should not say this but when I was a poor college student I would skim (read) them in the bookstore and buy copies of the magazine if I felt the article could use further review. Fortunately, I am now able to afford subscriptions to these magazines. Same can be said for motorsports engineering books. Read everything that you can get your hands on! Some are certainly better than others or more in depth but you might find different perspectives help mold or better define your thoughts on a various subject. Keep in mind that for a race engineer, motorsports books are not the only books of value. I own several books on human performance, psychology, team work and leadership, etc. It helps to understand what the driver is going through, how to best deal with him in difficult situations – believe me, even the best engineer/driver relationships have rough periods! – and how to best motivate the drivers and the crew. As a final note, with the rising popularity of motorsports sim games these are a good avenue for both drivers and engineers to learn the trade. In most cases the physics models are pretty good so car adjustments are realistic and data analysis options also exist. When I was at Forsythe Championship Racing several of the team members competed with other race team members at GTR2. The data from this game could be analyzed in Motec I2, which is the same analysis software that many professional race teams use. This provides a great opportunity to learn about car setup, driving, data acquisition at a VERY low cost! This experience should also provide some perspective when you have a driver just off pole at Long Beach and you think if he could just go a bit quicker…. How do you correct a car that understeers on entry and oversteers on exit…….and vice versa? Also, how do you correct a car that oversteers on entry AND exit, but understeers in the middle? It would be great if you could make the answer fit the chassis configuration of a NASCAR Cup car. Thanks; and I really enjoy this site!!!!! Wow… lots of options. My background is open-wheel cars and sports cars so I can offer answers along the lines of an Indy car on an oval which as the cars are vastly different might only have limited use. Jumping to the second part of your question where the car is doing one thing at the middle of the corner but the opposite on entry and exit, I would look at changes that would be more transient in nature (damper adjustment, rising rate spring or rocker, bump rubber, etc.) to improve the entry and exit balance, while for the center the change would be more directed at steady state handling (aero balance, mechanical balance –springs, anti-roll bars, etc.). For a situation where the car is doing several things in the corner, it is generally best to deal with the start of the corner first. For a corner where the car is uncomfortable braking, the turn-in (entry) is likely to be compromised as the car is not braking as you would like. After the turn-in is compromised, the middle of the corner will likely be impacted and so on. Even without braking, if you are not confident turning into a corner because you are afraid the back will not follow, the driver will likely carry less speed into that corner and will have to steer more in the center part of the turn as the initial steering was less aggressive than it should have been, so the car needs additional rotation later in the corner to get through that turn. As additional rotation is required at the middle of the corner, the likelihood is higher that the balance in the middle of it will now be understeer (push) but this could be avoided if the entry balance allowed the driver to be more confident allowing for less steering to be completed in the middle of the corner. Again what happens in the middle has an effect on the exit as a car that is understeering at the middle of the corner requires additional steering to rotate the car around the corner. At some point the speed or steering angle might be sufficient for the front wheel grip to increase which can be enough to tip the balance to oversteer for the exit. My question is about shocks and swaybars. I feel that having soft shocks is ideal for tires to stay in contact with the road as long as possible, and sway bars as stiff as possible to prevent body roll without lifting the inside tire. What are your thoughts on that? Also, I heard that hollow sway bars are now starting to be tested, is that true? Can you really make a tube out of spring steel? As I mentioned in a previous question, setup is always going to be a series of compromises. Your question only discussed shocks (dampers) and sway bars (anti-roll bars) however, corner springs (and depending on the series third springs/elements), bump rubbers, suspension geometry (and configuration) and setup (cambers, toes, etc.) all work together and are vital to a quick setup. Similarly there are “several ways to skin a cat.” Likely if you go to a race, take the top several cars and investigate the setup after a race you will find several different setups, yet the cars may all be very close in speed. To use your example you may have one car that has soft dampers and stiff bars but another car that has stiff dampers and soft bars. Again this is a very simplistic example as other factors are involved. I remember doing a test several years ago when I was working in open-wheel racing. An engineer had joined the team in the off-season from another front-running team. We had a new but very quick driver. At the test we ran the car how we would have set the car up during the season. The following day the other engineer suggested the setup based on his experience. The lap time was very similar but the driver reported that the feeling from the car was different for each setup. Both setups had strengths and weaknesses. Fortunately, this driver was experienced enough to be able to adapt to both setups. The benefit of this test was that we had learned alternate ways to exploit the potential of the race car we were working with. Every car is different, too. For example, with the Lola Champ Car it was uncommon to run a front or rear anti-roll bar on road courses. With the Panoz that followed, front and rear anti-roll bar use was common and often the damper curves run used considerably more low-speed damping that would likely have been used on the Lola. While these cars were different, the engine was the same, the weight and total downforce was similar yet the setups were different. It is common for anti-roll bars to be hollow. Some cars run torsion bars instead of springs, where one end of the torsion bar (spring) is mounted to the chassis and the other end is mounted such that the suspension twists the torsion bar during movement. I’m a bigger guy racing in Spec Miata. I’m about 20lbs over weight minimum. Until I get down to goal weight, is there something I can do in setup to offset my extra weight on the drivers side and higher center of gravity? Checking the rules for SCCA Spec Miata, depending on the car year, the minimum weight is between 2300 – 2400 lbs. Your 20lb extra weight represents less than one percent of the car’s weight. So if you were 20 lbs lighter and able to put this weight on the floor the change would have a very small effect on both the weight distribution and center of gravity height. That is the end of the good news. One of the simulations that is completed for each track we race is a sensitivity to weight – often to better understand the effect of various fuel levels on lap time. For our cars, with significantly more power and less mass than your Spec Miata, adding 20 lbs would roughly slow the lap time by 0.12s to 0.30s depending on the track (length, layout, etc.). Again, as the weight increase in proportion to the overall car weight is smaller, the effect will likely be smaller but conversely the power is less, for which the weight will have a larger impact. My suspicion would be that the lap time loss would be a little smaller than what we experience… certainly not something that you ideally want to hand to your competitors! What are some things you like to do to fix “grip” and forward drive through the corners? Good question! I would suggest starting with the data available. Do you have tire temps? Are the tires running at the proper operating temperatures? Similarly, is the tire pressure in the proper range? If the temps are low it is possible that the tire is not being worked hard enough to create temperature and therefore provide grip. Stiffer low speed damper settings, increased spring rate, increased rear weight distribution, etc. could all help load the rear tires further. Are the tires overheating and /or over-pressured? This could be a sign that the tire is being overworked. If the tire temperatures and pressures are in the proper range, increasing the front roll stiffness by softening the rear springs or anti-roll bars (ARBs), or lowering the rear roll center height – or going the opposite direction with the front springs/ARBs – might be a good direction based on the other setup issues that need to be helped. If the car has a differential, wheel-speed data will show if the differential is either too open or locked. Alternately, it is possible that more downforce is required. Certainly adding more downforce can be an inefficient band aid to other problems, but that does not mean that it should be ruled out if other solutions do not bring improvement. I know it always helps to have a baseline setup for your car at a particular track. But once you have that, how do you diagnose a problem with the handling of the car? For instance, if you’re having an understeer problem through the middle part of a corner, how do you know if you should be adjusting tire pressures, spring rates, shock settings or swaybars? Good question! Rarely – like never! – will a car have a single problem as reported by the driver, so you are always trying to solve multiple problems. This helps reduce the potential adjustments, as for example you would not want to increase rake to help mid-corner understeer if the car lacks stability or is oversteering on entry. Similarly, if the corner is a fast corner, you may increase the spring rate which will allow the front ride height to be lowered which will increase front downforce but also increase the mechanical balance which could cause understeer in slower corners. If the tendency is already for the car to oversteer in slow corners, you have helped two problems with these changes. Another thing to keep in mind is the size of a potential change. For example, depending on the anti-roll bar (ARB) design, the suspension geometry, etc., a change in ARB step might result in a much larger change in mechanical balance (or LLTD – Lateral Load Transfer Distribution – percentage) than a 100 lb/in change in spring rate, which may mean that for equivalent changes in mechanical balance the springs would have to be adjusted beyond what is reasonable for compliance or ride control (aerodynamic) purposes. Prior to running, I always calculate the percentage change in mechanical balance for springs, anti-roll bars and roll center heights (both front and rear) for changes around the current car setup. Similarly, I will look at what sort of ride changes I would have to make for given spring changes and what the corresponding change in aero balance for this ride change will be. Often this is further complicated by the use of bump rubbers or third elements, which are used for ride control. This, combined with aerodynamic changes I might consider – such as wickers, wing positions, etc. – provide a reference for the power of different changes that might be made to adjust aero balance. As a final thought, it is obviously helpful to keep in mind where in the realistic range of adjustment the current setup resides. For example, if you are running front dampers with a lot of low speed compression damping (relative to what you have run in the past) and the driver is complaining that turn-in is lazy, you are likely to look at another option to help this problem. I am currently in high school and I am looking into colleges. I want to become a Formula One race engineer and I was wondering if you had any suggestions for good colleges that would help me achieve my goal? I would rather go to a college in the U.S. or Canada but I am open to suggestions for international colleges. Any well rated University with a mechanical or aerospace engineering degree will likely suffice. As a secondary factor, I would investigate whether the school has an FSAE, SAE Mini Baja or SAE Supermileage program that you can get involved in. Additionally, the proximity to professional motorsports teams would be beneficial. While at University, I raced karts at many of the circuits that I now work at in the ALMS (Road America, Mid Ohio, VIR, Road Atlanta, etc. ), spent summers working for a local sports car team and helped out with the schools FSAE team in whatever spare time remained. Additionally, it is worth checking into schools with a motorsports engineering program. In the U.S., Clemson, Colorado State University and IUPUI have these programs. I have worked with graduates from each of these programs and in the case of IUPUI I have seen many of these students intern for several open-wheel teams – aided in part, I’m sure, by the school’s proximity to the race teams in Indianapolis. Does the Honda program lend a ton of support, or does the Pickett team do a lot of its own development on the ARX-03? Honda Performance Development (HPD) and Wirth Research (WR) certainly support the program and along with Michelin are great engineering partners to have. At each event HPD provides an engineer to support the running of the engine. Often we have additional HPD representation who support both ourselves and the other HPD runners (in P1 and P2) in the areas of reliability, electronics, wiring, etc. WR also has an engineer available to support the chassis and aerodynamics. Michelin has a dedicated support engineer on hand for our program. Having said this, the engineering group at Pickett Racing performs simulations for each event, is responsible for the car build and setup specification and engineers the car at events and tests. The communication that exists between Pickett Racing, HPD, WR and Michelin is such that each party is kept aware of the plans and configuration of the car. All pre and post event and test reports from the team are shared with our engineering partners. We also welcome input from these engineering partners. Hi Brandon, in stock car racing I read a lot about roll centers or “moment centers” as Circle Track calls them. You don’t hear a lot about that in formula cars or even sports racers. I’m sure it’s just as important. Do today’s super stiff setups change anything? Thank you. Certainly roll center location is important in formula cars and sports cars. Why do they appear to get less attention in these series? Possibly because these series get less media attention in general or engineers choose to discuss them less or even, depending on the car, the scope of adjustment is limited. For example, on the Lola Champ Car the front roll center height options were standard and low positions. The rear had more options and was certainly an important adjustment item. Another thing to keep in mind is the difference in the types of racing between different series and even different tracks. On the surface, the idea of running an oval particularly with the same banking at each end seems very simple, however this simplicity makes the solution incredibly complex as the performance peak is very small. Conversely, on a road course where corners are fast and slow with varying radiuses, entry speeds, surface conditions and topography, the best setup will always be a compromise. It is the best compromise for the entire circuit, generally weighted by the areas for the biggest gain in lap time. So with this being the case, small changes on an oval to get closer to the optimal setup – for a given driver, car, track condition, etc. – can have larger performance implications. Hey Brandon, it must be pretty cool to be working for Muscle Milk Pickett Racing Team but it must come with a lot of pressure! What are the differences with working with Pro Drivers vs Gentlemen drivers and how does the power output of the Honda motor compare to that of the PC car? Thanks for your time! I think that there are some really good gentleman drivers, just like there are some very average “pro’ drivers out there, so really for me, difference in driver abilities, as a complete package, is often bigger than the expectation for what constitutes a pro or a gentleman driver. Having said this, working with a driver who has less experience or pace requires a bit more coaching than would be expected with a more experienced driver. This coaching can come from the pro driver, a driver coach or the engineer. Ideally, the pro driver is helpful in this process but sadly this is not always the case. I have heard pro drivers mention how they jumped in the car, went faster than the gentleman driver, proved what the car can do and so their job is done. This attitude is not beneficial to the overall success of the team. Obviously, this assumes that the “gentleman” driver is willing to listen and improve but if this is not the case, in this business you are likely doomed from the start. The car setup is a delicate balance between any two drivers. Both Klaus Graf and Lucas Luhr are awesome pro drivers but they have slightly different styles which would ideally dictate slightly different setup preferences. Yet these are two of the most compatible drivers I have worked with. As the difference in driving style or ability increases, it’s likely the preferred setup will too. The balance is that the quicker driver should be better able to “drive around” a setup that is not exactly to his liking. However, should the race come down to a shootout, you want to make sure that this driver has the best chance of success. Having said this, the less experienced or gentleman driver is likely to see greater fluctuation in lap time should he not be comfortable driving a particular setup. For this driver, it is important to find out how fast he can go and work with him to ensure that he can do that same speed all race long. If he likes a car with a small amount of understeer but the other driver prefers a car that tends more to oversteer, the gentleman driver might really struggle with consistency and have a higher potential to crash a car that is setup to oversteer. Certainly not an easy answer! Generally, you are more likely to find success with a comfortable and consistently paced gentleman driver than eking out a bit of performance for the pro driver. As for your second question, the Corvette engine in the LMPC car is restricted to a target of 425hp. The target for LMP1 cars per the ACO is 600hp but the ALMS increased restrictor sizes slightly such that the cars are closer to the 625-650hp range. This said, LMPC cars are pretty cool for the budget. They are a really nice racecar that rewards hard driving, consistency and intelligent racing. While the class boasts one of the larger field sizes in the ALMS, it is a shame that it is not even larger. What is the most common mistake that you see made by drivers when they give you feedback on the car? Thanks for your time! I have been fortunate to work with very experienced drivers, some of whom have a very good sensitivity for what the car is doing and others that are still very quick but have much less “feel” for what the car is doing beyond a general understeer/oversteer comment. In a few cases, particularly if I have just started working with a driver, they may feel it is important to provide feedback beyond what they would normally feel comfortable giving. While it is important for a driver to pay attention to the car’s behavior, it is acceptable to report that he is not sure what the car is doing at a certain corner or part of the track or even under certain conditions (braking, turn in, etc.). It is far better for a driver to report that he is unsure what the car is doing than to “make up” a feeling. Other tools exist (data acquisition, visual, etc.) to help fill in gaps, should the driver not have a clear picture of an aspect of car behavior. Providing unsure or potentially inaccurate feedback only wastes valuable time. What is the best way to measure bump steer for your race car using normal everyday garage tools? Certainly it is possible to measure the bump steer on a car with several tools, as essentially all that is being completed is a measure of the wheel angle at discrete positions of suspension travel. Generally these discrete positions consist of maximum compression and rebound travel expected to be seen on track or some reasonable displacement in each direction (1” in both compression and rebound for instance). Thus a means to adjust the suspension position (jack, adjustable length struts, spacers, etc.) and a way to measure the difference in wheel angle (or easier wheel angle displacements) from reference (ride height) will get the job done. Dial indicators, calipers and steel rules can be used for this measurement. As a bump steer measurement kit generally only runs a couple hundred dollars, I have never found the need to resort to any other methods of rigging/setup. I was told a story about someone using a laser mounted to a wheel with the laser pointing at a surface in front of the car where the change in laser position was measured for the various suspension positions. While this method gets the job done, is seems over-complicated to me. As a final note, small differences in bump steer can have big effects on the car’s handling so it important to use measurement tools with reasonable precision, so I would pass on the tape measure. What are your thoughts on tire warmers and, if used, will the life of the tire be extended? The life of a tire is primarily limited by two factors – wear (tread depth) and the ability to provide grip. Grip will be affected more by the use of tire warmers as it should reduce the heat cycles the tire experiences. While all tires are different, heat cycles (tire temperature change from ambient to “hot” on the track and then back to ambient) generally degrade the grip level of the tire. As such, using tire warmers on a test day where several runs are completed with short breaks in between can be very effective for extending the life of the tire. Additionally, every track/tire is different. I have seen cases where it takes many laps to get the tire to “come in.” In this case had a tire warmer been used, it is likely that the same tire would have “come in” much quicker which allows runs to be more efficient. This improvement in efficiency might mean that less runs are required to complete the test or at least less laps per run are required which can mean savings in engine miles, tire use, etc. At the top levels of motorsport, where costs are analyzed per mile – and are in the thousands of dollars! – reducing the mileage required to get up to speed is very important and in these situations, I believe the cost of a few sets of tire warmers would be seen as an efficient solution. Conversely, in a production based series where the tires are extremely durable and the grip degradation between heat cycles is small and possibly the tire performance peaks quickly on a run, tire warmers then could be seen as an unnecessary added expense. As a final note, depending on the tire, the grip level can change dramatically between a cold tire and a tire at running temp. Inevitably this leads to a greater opportunity for driver error, which at worse ends up as a crash in which case the cost of tire warmers would likely be seen as a minor cost. Alternately, it could be said that this is part and parcel to being a professional racecar driver…. Hi Brandon, As a part-time driving coach for a dozen years, I realize the importance of understanding the dynamics between the road’s surface and the tire’s contact patch. I’m very interested in the topic and want to learn more about the entire system; the effects of damping, reducing unsprung weight, finding proper suspension settings, the effects of higher speeds and different driving styles, to maximize mechanical grip. How do you tell what to focus on first and can you recommend a couple of references that will help non-engineer types implement an improvement process? Thanks for your advice! This is certainly a very broad question, which given the scope of this forum I will do my best to answer. Starting with first areas of focus, I believe it is important to treat the car as a complete system, and therefore the setup is based on a strategy for what you are trying to achieve for a given circuit. Is the circuit fast or slow; is there hard braking; is it bumpy; are there elevation changes; what is the altitude; and how is the general surface grip level? These factors will start to form priorities for downforce levels, aero balance, suspension setup, gearing, damping, etc. Upon arriving at the circuit and running for the first time, particularly with a new car or circuit, I have a checklist of things that I look into. For example, is the car bottoming? If not it should probably be lowered. If it is bottoming, is the level acceptable? What is the brake bias? Is either end of the car locking under braking? If the driver is new, I would look at his brake pressure trace. Is he applying the brakes correctly? On throttle, is wheelspin evident? If so, how much, where, one wheel or both? Does the steering trace look normal or are many “corrections” evident or too much wheel lock? I have further metrics that I use to have a look at understeer/oversteer, suspension behavior, aerodynamic behavior, etc., but this is the basis of my initial checklist that I use to see if the car appears to be doing anything odd or unexpected. For the second part, references…. I have a large motorsports engineering book collection. I try to read anything I can find related to the subject no matter how advanced or basic the scope of the book. Quite often I am surprised as I reread some of the books how something applies to a problem that I am working on that I might have glossed over previously. The Racing and High Performance Tire by Paul Haney might be a good place to start. Certainly Race Car Vehicle Dynamics by Milliken and Milliken continues to be a great overall reference, as do Carroll Smith’s series of “How to Win” books. I have a daily driver 2011 BMW M3 that I use for HPDE/trackday events up to 10 times a year. I’ve been using a dedicated set of wheels with R-comp Nitto NT01s for track duty. Other than a big brake kit and Dinan suspension with more negative camber, the car is unmodified. Would changing my track tires to an even stickier, more aggressive compound such as BFG R1s or Continental Grand-Am takeoffs place undue stress on my non-race spec suspension components? Would it just end up being counterproductive? Thanks! This is certainly not my area of expertise but I would offer that track days alone will increase the stress on a daily driver. Improvements to the suspension and brake system will help those systems cope with this increased stress. Increasing the grip level via better tires will further increase the stress on vehicle components. As far as being counterproductive, this is really a matter of personal expectations. Nearly always when we do simulations of lap time improvement for various car components, (downforce, drag, horsepower, CG height, etc.) grip level (whether tire grip or track surface grip) is the biggest contributor to lap time. Look at current F1 races when the tires go off and the lap time skyrockets for proof of this concept. Therefore, the ability to increase the grip of the tires on your car will certainly result in lower lap time.